Where's the closest RV Dump station at a campgrounds, a rest area, a truck stop, a water treatment plant? RV Dumps knows these things. And you can easily know too. This same data is part of the "Camp and RV" app which has a dump station filter in it. 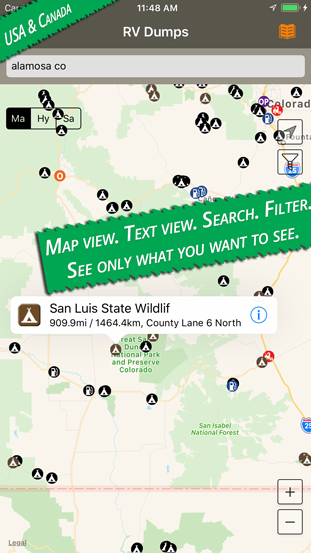 RV Dumps checks your location and displays up to 150 points on a map view. You can filter by type to see only what you want to see on the map and zoom out. You can also use the offline manual lookup to find locations by type, state and city...even when you have no phone service! RV Dumps takes the database from the top ranked camping app called Camp & RV and filters all points that have a dump station as an amenity (not "hookups" which are at a site. Many parks no longer have stand alone stations.) Maybe you need one and a night stop or you are just passing on through. From Rest Areas to truck stops to private campgrounds (either stay the night or call to see if you can pay a separate fee). From State Parks to even some National Park and Forest campgrounds that have one. Dump stations are being paved over left and right these days. We removed several each day that are found to be closed. Please send in reports and adds. I have hundreds more dump locations that I don't have GPS points for so they can't be placed in the mobile app yet. I keep working on those. - Search for specific locations around you on a map. - One-touch calling for places that have a phone number listed. Good idea to call and ask about the fees as Flying J now charges for it. - One-touch turn-by-turn directions for all POIs. - Works when iPhone has no phone service. - Supports a manual lookup mode where users can look up parks and truck stops that have RV dumps. The recent update makes major changes that previous app reviews won't reflect. We added thousands of places like wastewater treatment plants, dealerships, gas stations, public places, storage places and stores. - Added couple hundred dump stations and removed many that have closed. - Added thousands of dump stations, from stores and gas stations to wastewater treatment plants. - Expanded filters to find places by type and more.